Crassula are a large genus of succulents, varieties include both low growing types as well as large plants. They are a low maintenance plant and require very little water. Most grow well in good sun and many make great indoor plants with attractive foliage, some with beautiful flowers as well. Although they are best known for the Jade Plant (Crassula ovata) many other species and cultivars are worth looking for. Mostly from East Africa they have become very popular as indoor plants. One factor that nearly all of these plants have in common is that they are not suited to areas that experience heavy frosts or freezes, so it is a great thing that they are suited to growing indoors. With over 300 named species and 1000s of cultivars this is a fascinating genus. How to Grow Crassula . 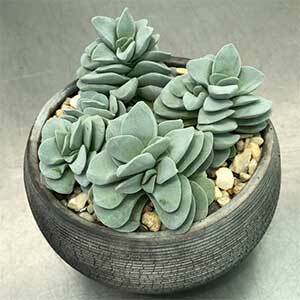 In general the three main factors in caring for Crassula are soil , water and light. Actual requirements will differ between species and cultivars. One of the main issues with all varieties is watering, these are a plant that are used to dry conditions and need the soil to dry out between waterings. It is very tempting to give plants growing in containers a little water every week, however in most condition these plants do not require it. Overwatering will cause root rot and the eventual death of the plant. In many cases Crassula can be watered once every 3 – 4 weeks, given a good soaking and then left alone. These are a slow growing plant, so over fertilisation is another issue. A free draining growing medium is essential, these are not a hungry plant so rich soils are not required. 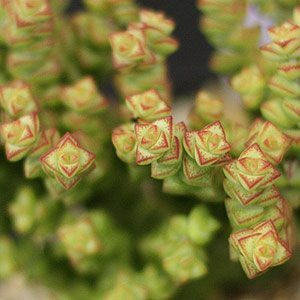 Crassula prefer full sun to part shade, and are generally regarded as drought tolerant. The warmer the climate the more afternoon shade is suited. Like many succulents, the foliage colour will change with more sun. In most cases the reds will be intensified, less water will also improve the red colors. A small application of fertiliser each spring as new growth commences is generally adequate. Plants can be pruned back to keep in shape and new plants are easily propagated from cuttings and seeds. Leaf drop can occur if the plants are exposed to very high temperatures. In hot summers they can go into dormancy as a means of self preservation. In very cold areas they will not put on much growth at all. It is the wide range of of species that makes generalisation a little difficult, some species are tall and will reach over 2m in height, others such as C. multicava are tiny, ground hugging with some to 10cm and less. In recent years cultivars such as ‘Morgan’s Beauty’ with wonderful pink flowers have become popular, as have the so called ‘Stacked Crassula’ which include emerald Pagoda and others. C. hirta is a low growing species, also known as C. nudicaulis. Long, fleshy leaves that are covered by fine white hairs. C.muscosa is a small branching succulent sometimes called the ‘Watch Chain’. C. ‘Baby Necklace’ and this is a hybrid between C. perforata and C. rupestris var marnieriana and here is Crassula perforate itself. C. quadrangularis syn. Crassula pyramidalis is a very slow growing, species, its natural growth habit is to form a square column. C. Morgan’s Beauty is compact growing and has large red to pink flowers, again this is hybrid, this time between C. falcata and C. mesembryanthemopsis. C. perfoliata var minor of sometimes called the aeroplane plant and when you look at the growth habit, you can see why, previously know as C. falcata. And here we have it in its variegated form, an here is a dwarf or miniature variety. C.rubicualis is a larger species, it has great colour at the moment, thats because it has had a bit more sum, and has been allowed to dry out a little, most crassula will put on more colour in sunny dry conditions. C. exilis ssp. cooperi has brilliant patterned foliage. C. hemisphaerica is a wonderful form, very rare in cultivation. C. Ivory pagoda is a hybrid, slow growing and a C. flacata C. perfoliate cross. C. deceptor is an attractive dwarf species with overlapping foliage. 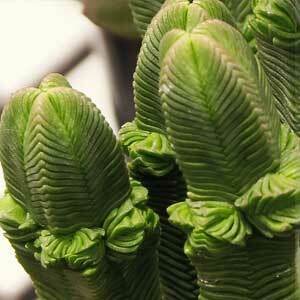 C. Green pagoda will reach around 20 cm or 8 inches in height, and is one of a number of ‘stacked’ Crassula.